Three’s a disaster when things come unraveled. Rock star Nate Keller is on top of the world, but his headlining tour has one drawback. It keeps him away from his boyfriends, Theo and Cameron, for weeks at a time. Yet after four-and-a-half years—and a lot of hard work—the trio is still going strong. But then Cam comes to visit with devastating news. After seventeen years together, he and Theo have agreed to a trial separation. Nate tries desperately to fix his lovers’ broken relationship, but there’s only so much he can do from the road. At home, Cam tries to carry on, but feels like his whole life is spiraling out of control. Theo struggles to cope with the split as his depression worsens. They’re both spinning their wheels, quickly losing hope they can keep it together—and keep the man they both still love. Desperate, Nate drops everything in a last-ditch attempt to pull their trio back together before they hit rock bottom. Except their love could already be shattered beyond repair. Warning: Contains two men who must face how broken they are before they can fix their failing marriage, and the man who loves them both—but doesn’t know how to save them. This story was a brutal emotional ride. The emotional angst at the end of this long-term relationship is terribly raw, messy and ugly. And while some of the miscommunication between Theo and Cameron was a little over the top, other parts of this story will feel uncomfortably realistic to anyone who has ever committed to a long-term relationship. I chose this book because of the blurb: “rock star”, “m/m/m” and “LA Witt” – this was always going to be an instant download for me. A word of caution for readers with similar reading predilections – this is darker than anything I’ve read by LA Witt. Even the rock star’s life is made miserable by his warring lovers. And as two of the three in the m/m/m are at each other’s throats, there isn’t much m/m/m to enjoy either. It is difficult to connect with characters engaged in the nasty sniping and mudslinging at the end of a relationship, so I struggled to warm to either Cameron and Theo until the very end. Nate’s brooding misery wasn’t terribly endearing either, making this a very difficult read at times. 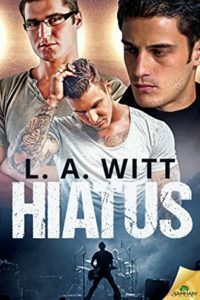 As always, LA Witt’s writing has emotional depth and the connections between her characters are compelling. I found the ending to this story slightly implausible and the resolution too quick and far too simple for such a brutal tale of break-up woe. But I didn’t – couldn’t – put this down and I appreciate the skill with which LA Witt makes her characters come alive, even when I don’t like some of her characters very much. This book was very realistic and the problems that were dealt with felt very realistic. First let me say that this is not the first book I’ve read by this author and I felt it was honest and upfront about the problems faced not only in a triad but depression. This whole story was very unique and I loved how the author projected the characters. I had an immediate connection with Nate but found that Theo and Cameron it took a while to develop that connection. They was definitely drama in this story so be prepared if you choose to read it. This is the type of story; I feel that you need to be in a certain frame of mind to read. Luckily I was in that frame when I read this book.